guffaw1952, Thanks for having an open mind about my idea, we fifties children (1954 for me) can be pretty set in our ways, but as a retired safety director and coal miner I tend to work from experience to make things better. If you want to see the easy way to do something (not necessarily the safest) just give the job to a coal miner. There is no doubt that 230 grain hollow points are better than 230 grain FMJ’s for most anything except complying with the Geneva Convention and that they have done the job for many years, but a lighter, faster, bullet with more energy that will do the job more efficiently can be had using less lead (and therefore money) and be less weight for these old bones to carry. I figured it up and I think a box of 125 grain .45 ACP rounds would be about 1/3 of a pound less to carry than 230 grain ones. Jeff Cooper, like the rest, learned to use what was issued or available (and then got set in their ways), I think I could even convince them (if they were still around) if I could just get the bullets made to show them. 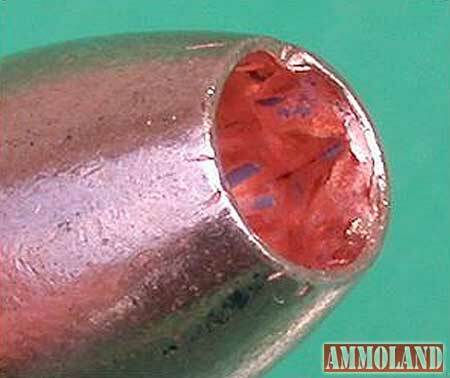 Let me bounce another bullet idea off of your intellect, what about a125 grain FMJ .45 ACP round with an aluminum core around a steel penetrator in a copper jacket for the military? It would act as a normal FMJ in soft targets to comply with the Geneva Convention but deliver a steel penetrator to enemy soldiers or terrorists wearing vests. The steel penetrator really improved the little .22 that our soldiers are required to carry. Interesting perspective and concept. Thanks. I suspect a 125-gr round in a .45 might not be subsonic; it would almost certainly be a lot faster than a heavier projectile. The 185-gr HP rounds I sometimes use are almost 300 fps faster than the 230 gr equivalent. So I compromised with a 200-gr +P round with an expanding full metal jacket. It’s a bit faster than either. The lead 125/127 grain bullet works, it took me a long time to find a way to have the mold made. I have shot it at 1,650 fps, it is accurate and expands better than 185 and 230 grain hollow points in my experience. You can see the bullet on sscastbullets.com (I gave them some of my bullets to test, they have the bullet as a 130 grain bullet). It casts out of the mold I had made between 127 and 130 depending on the alloy. Jeff Cooper would roll over in his grave if he could shoot some of these bullets… as they unleash the full potential of the .45 ACP. Regardless, I did find this suggestion an interesting exercise. I’m very intrigued by the 127 gr up. In looking for the most effective defense bullet for my 1911. I also have a XD-S. I want expansion, high energy release with out going through what i might have to shoot. Sounds like you may have the same thoughts. I’m getting ready to start casting bullets and found your proposal on Ammoland. How can iI get a copy of your mold?